I have a view & its Constraint is as per following. Break on objc_exception_throw to catch this in the debugger. The methods in the UIConstraintBasedLayoutDebugging category on UIView listed in may also be helpful. Since you have already a constraint in IB, update that in code. You don't need to add a constraint for the same purpose. Connect an IBOutlet to that constraint and modify its constant value in code. You're adding a new constraint there. The old constraint is still in place, and it can't satisfy both, hence the warning. You need to modify the constant property of the existing constraint. The best way to do this is to make an outlet to it. Not the answer you're looking for? Browse other questions tagged ios objective-c uiview autolayout or ask your own question. 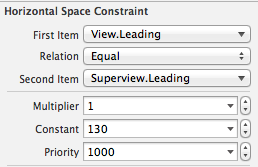 Can I just ignore “Unable to simultaneously satisfy constraints”? Why iOS Simulator show my app as I want and my iphone doesn't show anything?